My kids are 17 and 2 weeks shy of 15. They are bright, kind, and hilarious. We took a last minute emergency '“Mom-needs-a-vacation” vacation last week. We haven’t quite found our groove with this new lifestyle. Let’s put it this way: they applaud when I cook and we actually sit down for a meal together. So, for 7 days, I was stuck to them like white on rice. With very limited internet access, our phones became cameras and music players, we read words on paper, stretched our vocabulary through extended conversations, learned how to be good losers and gracious winners by playing 20+ games of cards, and really honed in on our bantering skills. Our favourite show for the past 6 years has been The Goldbergs. Throughout the first episode, the only words coming out of the kids’ mouths were, “OH MY GOD, MOM, YOU ARE BEVERLY!!”. To which I responded, with a smile, “That is the best compliment ever!” For the past 4 years, there has always been a gift from “Beverly” under the Christmas tree. Year 1: the book: Man Up! 367 Classics Skills for the Modern Guy for Nathaniel (age 13 at the time). Year 2: a shopping spree with Mom at Mom’s favourite store for Alexis. Year 3: Matching pyjamas with custom shirts: Schmoopie Pie for them, Mama Bear for me. Year 4: an afternoon of family fun at V Pottery (our neighbours in the same building as La Goélette à Pépé cafe). Because what senior high teenager (and his girlfriend) wouldn’t want to spend 3 hours crafting with their mother? is a small pottery studio on Isle Madame owned by artist Victoria Bonin MacKenzie. Deeply inspired by the love of her home, Isle Madame, her pieces reflect local history and culture through colour and image design. 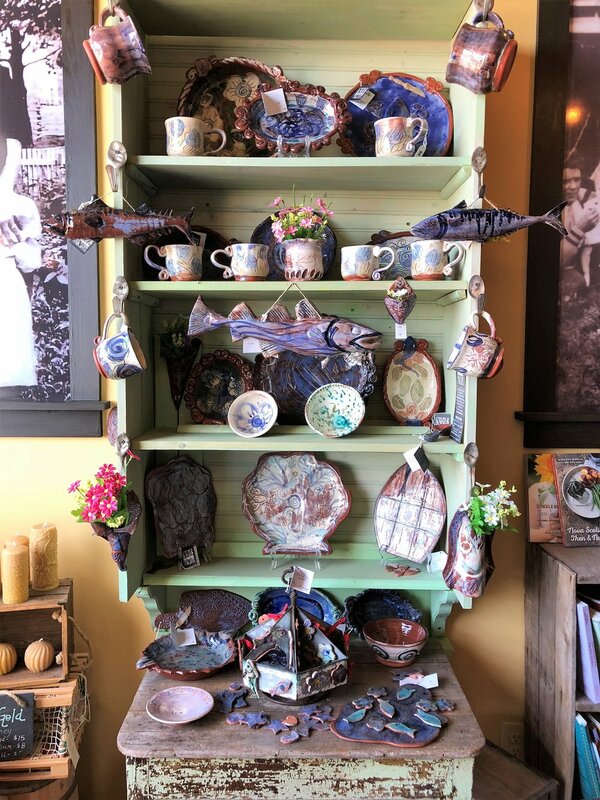 She makes functional red earthenware pottery mugs, bowls, serving dishes, platters and ornamental decor pieces (her fish are incredible!). The red clay used is from Nova Scotia. The processing gives it a smooth consistency (much like fondant, actually, which is a medium I’m very familiar with from my previous life). It’s cool to the touch and almost feels wet but not really. We huddled around the work table as Vicki explained the clay, where it’s from, and the basic methods used in creating pieces. We were each given a significant chunk of clay to start creating. Along with trimming tools, Vicki has a plethora of decorating tools available for you to use: rubber stamps, buttons, and small trinkets to make imprints, cookie cutters in various themed shapes, and plastic trays used as molds for cups, plates, platters. We start out with clay the size of a golf ball and create a simple pinch pot together. Then we each get a turn throwing clay (which means creating something using the pottery wheel… I know you all know that famous scene in the 1990 film Ghost… isn’t that what instantly comes to mind when you see a pottery wheel??). Folks…. it is NOT as easy as it looks. Vicki has all the patience in the world and none of us were rushed off the wheel. Once our pieces were finished, we added some colour using a white clay base with oxides - but the thing is… there’s not really a colour to it until it’s been fired in the kiln. It’s very challenging trying to paint something when you can’t instantly see the colour. Pretty sure our pieces will be “abstract”. At the end of our 3 hour session, I got 2 thumbs up from both kids and we are all looking forward to seeing our finished pieces! V Pottery studio is located in the same building as La Goélette à Pépé next door to The Clairestone Inn in Arichat, Nova Scotia. If you are interested in booking your own pottery class (and I would highly recommend this to anyone who has ever wanted to try or those who are looking for something different to do with friends on Isle Madame), please contact Vicki directly through her website contact form or by calling 902-631-2995. If you are interested in booking a workshop with an overnight stay at The Clairestone Inn, please call us for package details: 902-226-2200.